These days, it’s getting easier and easier to eat wholesome vegetarian food in restaurants. Vegetarian restaurants obviously offer the most choices, but you’ll also find plenty of good vegetarian food at ethnic restaurants, such as Mexican, Italian, Indian, Chinese, and Thai restaurants, since many of their dishes are focused on vegetables, with beans, lentils, or tofu being the main protein source. Most other restaurants have something available for vegetarians, and even many standard American restaurants offer a veggie burger alternative to the ubiquitous hamburger these days. Be bold! If nothing on the menu appears to be vegetarian, feel free to ask if something special could be made for you, using ingredients you can see they would have on hand. Many vegetarians have tried this with great success, and very often the chef has appreciated the challenge and the chance to be more creative. Do your part for the next guy. 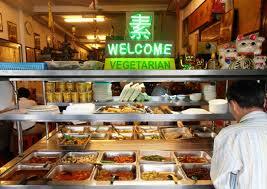 The more people ask for vegetarian dishes, the more restaurants will recognize the need to offer them. For too long, many vegetarians have been timid in this regard, but the restaurant owners we know tell us they actually like receiving these requests because it gives them a better idea of what people really want. This is an extract from our book, Say No to Meat: The 411 on Ditching Meat and Going Veg, by Amanda Strombom and Stewart Rose.